In the event you need to edit your PHP on your VPS or Dedicated server, you will need to access the WHM in order to do so. 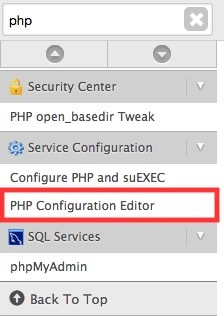 Editing the php.ini will not help you. Once in the WHM go to the search bar, in the top left, and type PHP. When you are done go to the bottom and click Save. How do I configure Dreamweaver MX for PHP and MySQL? How to assign a dedicated IP to a domain on a dedicated server.